A non-woven synthetic underlayment with a grey coated polypropylene spun bond fabric surface, a polypropylene 10 × 5 scrim and a grey backside coating. Lay lines and cap-nail locations printed on the underlayment. Also includes additional high wind and Florida cap-nail locations. UNDERLAYMENTS BEGIN TO AGE AS SOON AS THEY ARE EXPOSED TO NATURE, AND BUILDINGS EXPERIENCE AGING FACTORS DIFFERENTLY. 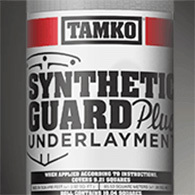 BECAUSE IT IS DIFFICULT TO PREDICT HOW LONG UNDERLAYMENTS WILL LAST, TAMKO OFFERS A LIMITED WARRANTY ON SYNTHETIC GUARD PLUS UNDERLAYMENT THAT INCLUDES A BINDING ARBITRATION CLAUSE AND OTHER TERMS AND CONDITIONS WHICH ARE INCORPORATED HEREIN BY REFERENCE. YOU MAY OBTAIN A COPY OF THE LIMITED WARRANTY AT TAMKO.COM OR BY CALLING 1-800-641-4691. IMPORTANT SAFETY INFORMATION: Use personal fall protection devices when working on a roof. Personal fall protection devices, safety glasses and hearing protection must always be used when applying Synthetic Guard Plus underlayment. Moisture, frost or debris will decrease the traction when walking on Synthetic Guard Plus underlayment. Applicator safety is of utmost importance. 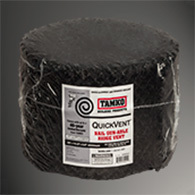 A non-woven synthetic underlayment with a black coated polypropylene spun bond fabric surface, a polypropylene 5 × 5 scrim and a black backside coating. UNDERLAYMENTS BEGIN TO AGE AS SOON AS THEY ARE EXPOSED TO NATURE, AND BUILDINGS EXPERIENCE AGING FACTORS DIFFERENTLY. 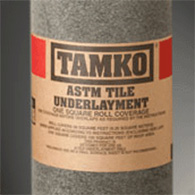 BECAUSE IT IS DIFFICULT TO PREDICT HOW LONG UNDERLAYMENTS WILL LAST, TAMKO OFFERS A LIMITED WARRANTY ON SYNTHETIC GUARD UNDERLAYMENT THAT INCLUDES A BINDING ARBITRATION CLAUSE AND OTHER TERMS AND CONDITIONS WHICH ARE INCORPORATED HEREIN BY REFERENCE. YOU MAY OBTAIN A COPY OF THE LIMITED WARRANTY AT TAMKO.COM OR BY CALLING 1-800-641-4691. IMPORTANT SAFETY INFORMATION: Use personal fall protection devices when working on a roof. Personal fall protection devices, safety glasses and hearing protection must always be used when applying Synthetic Guard underlayment. Moisture, frost or debris will decrease the traction when walking on Synthetic Guard underlayment. Applicator safety is of utmost importance. 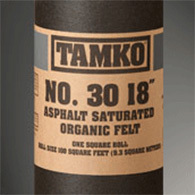 Features a TAMKO organic felt saturated with asphalt. 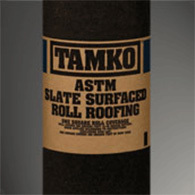 Accepted for use as an underlayment felt to be applied over the deck prior to the installation of TAMKO asphalt shingles. Laying lines 2", 4", 17"
Notice: This product is sold "AS IS" and without warranty of any kind, express, implied or statutory, including but not limited to the implied warranties of merchantability and fitness for a particular purpose. IMPORTANT SAFETY INFORMATION: Use personal fall protection devices when working on a roof. Personal fall protection devices, safety glasses and hearing protection must always be used when applying this product. Moisture, frost or debris will decrease the traction when walking on this product. Applicator safety is of utmost importance. 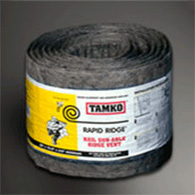 Laying lines 2", 8-1/2", 11-1/4", 17"
Features a TAMKO organic felt that is saturated with asphalt. 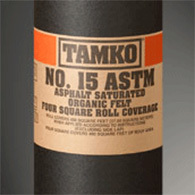 Accepted for use as an underlayment felt to be applied over the deck prior to the installation of TAMKO asphalt shingles. 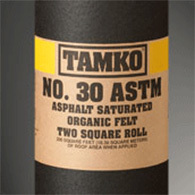 A TAMKO organic (non-perforated) felt that is saturated with asphalt. 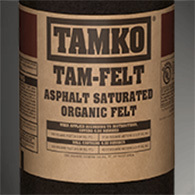 TAM-FELT® serves as an alternative to ASTM D226 Type I & II saturated felt, and has been tested by a third-party laboratory in accordance with ICC-ES AC188 and the physical properties of ASTM D226. Accepted for use as an underlayment felt to be applied over the deck prior to the installation of concrete tile. 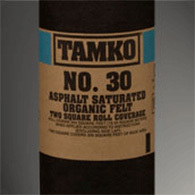 This underlayment contains a TAMKO organic felt saturated with asphalt, then coated on both sides with a weathering-grade asphalt and surfaced with opaque granules. An alternative for No. 30 asphalt saturated organic felt. Saturated with asphalt and manufactured using a proprietary technology. Laying lines at 2", 4", 17"
Manufactured in Frederick, MD, Joplin, MO, Phillipsburg, KS, and Tuscaloosa, AL. 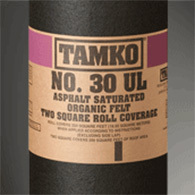 A non-UL saturated felt made with a TAMKO organic felt (non-perforated) saturated with asphalt. Accepted for use as an underlayment felt to be applied over the deck prior to the installation of TAMKO asphalt shingles. 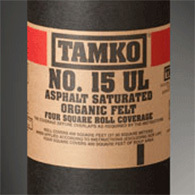 Laying lines 2", 4", 12", 17"
Features a TAMKO organic felt that is saturated with asphalt. Accepted for use as an underlayment felt to be applied over the deck prior to the installation of wood shake shingles. 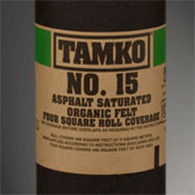 Features a TAMKO organic felt (non-perforated) that is saturated with asphalt. Accepted for use as an underlayment felt to be applied over the deck prior to the installation of TAMKO asphalt shingles. Laying lines 2", 12", 17"
Features an organic felt (non-perforated) that is saturated with asphalt. Accepted for use as an underlayment felt to be applied over the deck prior to the installation of wood shake shingles. UNDERLAYMENTS BEGIN TO AGE AS SOON AS THEY ARE EXPOSED TO NATURE. BUILDINGS EXPERIENCE AGING FACTORS DIFFERENTLY, SO IT IS DIFFICULT TO PREDICT HOW LONG UNDERLAYMENTS WILL LAST. 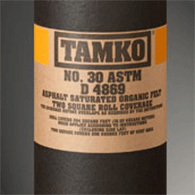 THAT'S WHY TAMKO PROVIDES A LIMITED WARRANTY ON MOISTURE GUARD THAT INCLUDES A BINDING ARBITRATION CLAUSE AND OTHER TERMS AND CONDITIONS WHICH ARE INCORPORATED HEREIN BY REFERENCE. YOU MAY OBTAIN A COPY OF THE LIMITED WARRANTY AT TAMKO.COM OR BY CALLING 1-800-641-4691. IMPORTANT SAFETY INFORMATION: Use personal fall protection devices when working on a roof. Personal fall protection devices, safety glasses and hearing protection must always be used when applying Moisture Guard underlayment. Moisture, frost or debris will decrease the traction when walking on Moisture Guard underlayment. Applicator safety is of utmost importance. A self-adhering rubberized asphalt sheet membrane with a polymer film on the surface and a removable treated release film on the adhesive side. Surface is textured for skid resistance and can be left exposed for up to 120 days. WATERPROOFING PRODUCTS BEGIN TO AGE AS SOON AS THEY ARE EXPOSED TO NATURE, AND BUILDINGS EXPERIENCE AGING FACTORS DIFFERENTLY. 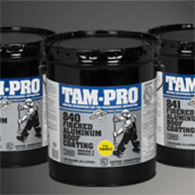 BECAUSE IT IS DIFFICULT TO PREDICT HOW LONG WATERPROOFING PRODUCTS WILL LAST, TAMKO OFFERS A LIMITED WARRANTY THAT INCLUDES A BINDING ARBITRATION CLAUSE AND OTHER TERMS AND CONDITIONS WHICH ARE INCORPORATED HEREIN BY REFERENCE. YOU MAY OBTAIN A COPY OF THE LIMITED WARRANTY AT TAMKO.COM OR BY CALLING 1-800-641-4691. 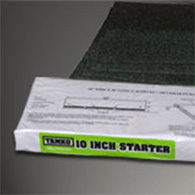 A fiberglass-reinforced self-adhering rubberized asphalt sheet membrane with a polymer film on the surface. Features a removable treated release film on the adhesive side for convenient installation and handling. 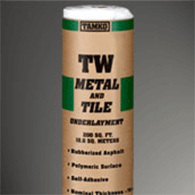 TW Metal & Tile Underlayment can be left exposed for up to 120 days and is used under metal roofs, mechanically fastened tile, slate, wood shakes, asphalt and composite shingles. 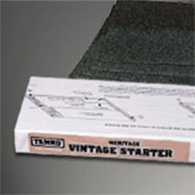 Part of a two-course layer that must be applied prior to the application of Heritage Vintage shingles. Shingle size: 12-1/2" x 36"
NOTICE: THIS PRODUCT IS SOLD “AS IS” AND WITHOUT WARRANTY OF ANY KIND. ALL WARRANTIES, INCLUDING BUT NOT LIMITED TO THE IMPLIED WARRANTIES OF MERCHANTABILITY AND FITNESS FOR A PARTICULAR PURPOSE, ARE EXCLUDED. A precut universal starter course shingle designed to eliminate the wasted time and material of field cutting 3-tab or roll roofing materials into starter course shingles. 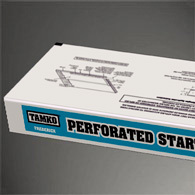 Perforated to allow them to be separated into two starter strips. 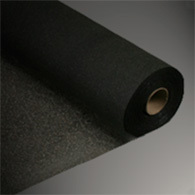 Made of fiberglass mat coated with asphalt and surfaced with ceramic granules. 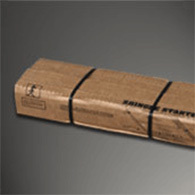 A precut universal starter course shingle designed to eliminate the wasted time and material of field cutting 3-tab or roll roofing materials into starter course shingles. Comes with a factory-applied sealant to eliminate the need for plastic cement. A starter course shingle to get the job started. Forms a cap along various angles of a Heritage® Vintage® roof. Made from a fiberglass mat coated on both sides with weathering-grade asphalt and surfaced with granules. Shingle size 12" x 12"
SHINGLES BEGIN TO AGE AS SOON AS THEY ARE EXPOSED TO NATURE. BUILDINGS EXPERIENCE AGING FACTORS DIFFERENTLY, SO IT IS DIFFICULT TO PREDICT HOW LONG SHINGLES WILL LAST. THAT'S WHY TAMKO® PROVIDES A LIMITED WARRANTY, THAT INCLUDES A BINDING ARBITRATION CLAUSE AND OTHER TERMS AND CONDITIONS WHICH ARE INCORPORATED HEREIN BY REFERENCE. YOU MAY OBTAIN A COPY OF THE LIMITED WARRANTY AT TAMKO.COM OR BY CALLING 1-800-641-4691. Add the perfect finishing touch and create a distinct look in the neighborhood with higher profile Heritage® Designer Ridge shingles. 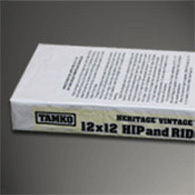 Up to 1/2" thicker than standard Heritage® Hip & Ridge, creating a dynamic finish. Constructed with SBS Modified Bitumen Technology. *Not all colors and sizes may be available in your area. 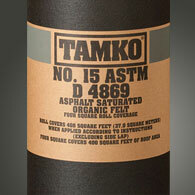 Contact your TAMKO sales representative for complete color and size availability. SHINGLES BEGIN TO AGE AS SOON AS THEY ARE EXPOSED TO NATURE. BUILDINGS EXPERIENCE AGING FACTORS DIFFERENTLY, SO IT IS DIFFICULT TO PREDICT HOW LONG SHINGLES WILL LAST. THAT’S WHY TAMKO PROVIDES A LIMITED WARRANTY THAT INCLUDES A BINDING ARBITRATION CLAUSE AND OTHER TERMS AND CONDITIONS WHICH ARE INCORPORATED HEREIN BY REFERENCE. YOU MAY OBTAIN A COPY OF THE LIMITED WARRANTY AT TAMKO.COM OR BY CALLING 1-800-641-4691. 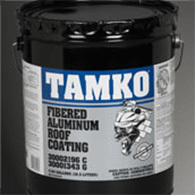 Provides a finishing touch for roofs. Precut shingles for installation on hips and ridges. Made with the same fiberglass mat and mineral-granule color blends as Heritage® Series shingles to give the same beautiful wood shake look on every inch of the roof. 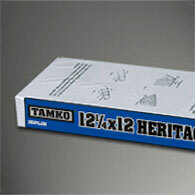 Provides the finishing touch along with TAMKO’s Heritage IR shingles for complete roof protection. Classified by UL for compliance with UL 2218 Class 4 Impact Resistance. 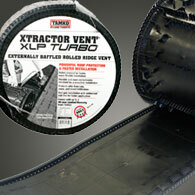 Designed to ventilate attic space when used in conjunction with soffit vents. Comes in a roll and can be applied with a nail gun to help speed installation. Exterior baffle design helps guard against wind-driven rain and snow. VENTILATION PRODUCTS BEGIN TO AGE AS SOON AS THEY ARE EXPOSED TO NATURE. BUILDINGS EXPERIENCE AGING FACTORS DIFFERENTLY, SO IT IS DIFFICULT TO PREDICT HOW LONG VENTILATION PRODUCTS WILL LAST. THAT'S WHY TAMKO® PROVIDES A LIMITED WARRANTY, THAT INCLUDES A BINDING ARBITRATION CLAUSE AND OTHER TERMS AND CONDITIONS WHICH ARE INCORPORATED HEREIN BY REFERENCE. YOU MAY OBTAIN A COPY OF THE LIMITED WARRANTY AT TAMKO.COM OR BY CALLING 1-800-641-4691. A self-contained 4-foot sectional shingle-over ridge vent designed for ventilation. Features both an external and an internal “sinewave” shaped baffle designed to help guard against wind-driven rain and slow infiltration. Each section also contains integrated end plugs located every foot to reduce scrap when splicing. 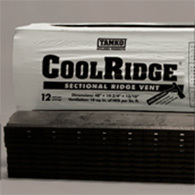 A self-contained ridge-vent product on a roll that can be installed with a nail gun. Made with a two-layer composite consisting of a nylon-polyester, nonwoven, non-wicking fabric. Heat-bonded to a compression-resistant open-nylon matting of three-dimensional construction. Requires no baffles, metal connectors, end caps or special filters. Capped with roofing shingles and completely hidden. Flexible to conform to roof pitches between 3/12 and 12/12. For pitches greater than 12/12, contact TAMKO® Technical Services Department. Manufactured using a two-layer composite consisting of a nylon-polyester, non-woven, non-wicking fabric. Heat-bonded to a compression-resistant, open-nylon matting of three-dimensional construction. Flexible to conform to roof pitches between 3/12 to 12/12. 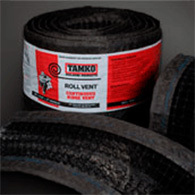 For Pitches greater than 12/12, See Installation on Steep Pitch or contact the TAMKO®Technical Services Department. A continuous ridge vent designed to ventilate attic space when used in conjunction with soffit vents. Can be installed with a nail gun. 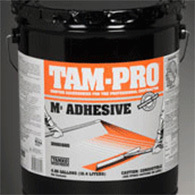 Multipurpose adhesive for low-sloped cold-applied roof construction. Bonds 19" selvedge, mineral surface and cap sheets to the underlayment. Doubles as an adhesive on 2" selvedge lap of mineral, granule or smooth-surfaced roofing. A specially formulated heavy-bodied material used as a waterproofing medium in new construction and as a general-purpose exterior repair and maintenance material. 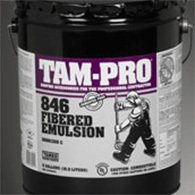 An elastic maintenance and repair medium for assisting with leaks. Helps with small repair jobs and shingle security. 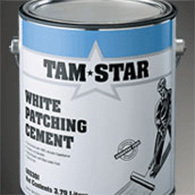 A general-purpose exterior repair and maintenance material for damp or dry surfaces. Use with wet and dry applications. 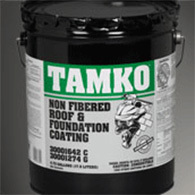 A coating that helps seal fine cracks and openings of low-sloped roofs. Renews and rejuvenates old composition roofing. Also works on metal or concrete surfaces. 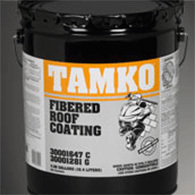 Provides a thin coating for low-sloped roofs, as well as metal and masonry surfaces. Can also be applied to steel, wooden fences and underground pipe. 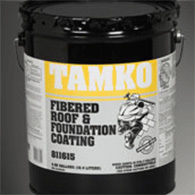 A medium-viscosity-grade fibered material that offers combined application as a roof or foundation coating. 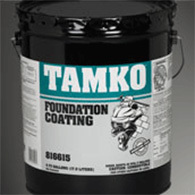 Foundation coating: 2 gallons covers 100 square feet per coat. Two-coat application. 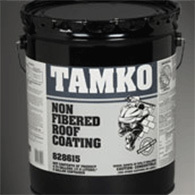 A thin-viscosity material that doubles as a non fibered roof or foundation coating. 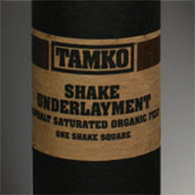 Foundation coating, 1 gallon covers 75–100 square feet per coat. Two-coat application. 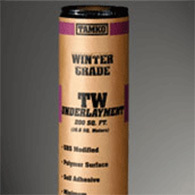 Non fibered below-grade moisture guard. Used for below-grade exterior concrete and masonry wall damp-proofing to help seal out moisture and prevent corrosion. 100% ASBESTOS FREE. Metallic reflective barrier for prepared roofing, metal surfaces and exterior masonry. Reflects the sun’s rays to help reduce energy costs while prolonging surface life. Creates a thin reflective barrier to reflect the sun’s rays and help prolong surface life. Also works on metal surfaces. 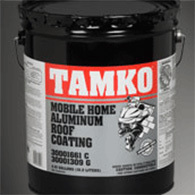 One-coat-application product for mobile home roofs. Reflects the sun’s rays to help reduce energy costs while also providing a decorative surface. A heavy-bodied, all-weather, trowel-grade mastic that contains select asphalts, petroleum solvents, tough reinforcing fibers and special additives for added spreadability. Dries to form a seal that allows for minor expansion and contraction. Used for flashing construction and other detail roofing work, such as tie-offs or shingle securement. 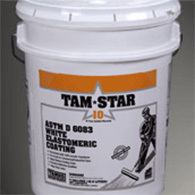 A wet/dry formula flashing cement manufactured for the professional roofing contractor. Blended from select asphalts, petroleum solvents and special fibers to a smooth, buttery consistency. 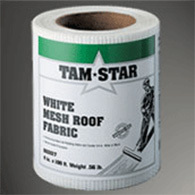 For use in flashing construction and other detail roofing work, such as tie-offs or shingle securement. 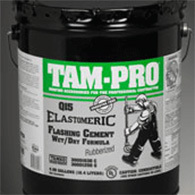 A heavy-bodied wet/dry formula rubberized mastic cement that is specially designed to remain pliable without running. Blended from roofing asphalt, petroleum solvents and interlocking fibers for vital thixotropic properties. For use on vertical and horizontal asphalt roofing flashing systems and waterproofing detail work, such as parapets and drains. 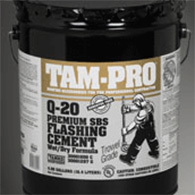 A heavy-bodied SBS polymer-modified trowel-grade wet/dry formula asphaltic cement. Combines refined asphalt, prime solvents, wet-surface additives, SBS rubberized polymers and interlocking fibers. Precisely blended into a smooth thixotropic material. Surface to be treated should be free of dirt, dust, oil and other debris. 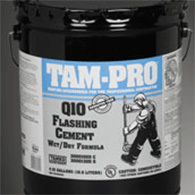 Prime all metal, concrete and masonry surfaces with TAM-PRO® Quick Dry Primer prior to use. Mechanical fasteners should be used to fasten the modified bitumen membrane per generally accepted roofing application guidelines on vertical or sloped flashings. 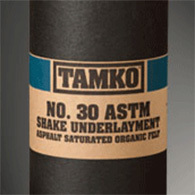 Check membrane manufacturer's application recommendations. 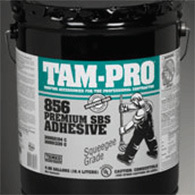 A special-viscosity adhesive blended to a smooth, even consistency—applied using a squeegee or spray equipment. 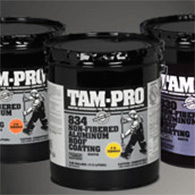 Used primarily as the interply roofing adhesive for modified bitumen roofing systems. Also used as an adhesive for granule- or gravel-surface coats. 100% ASBESTOS FREE. 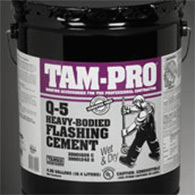 A heavy-bodied SBS polymer-modified trowel-grade wet/dry formula asphaltic cement. Combines refined asphalt, solvents, wet-surface additives, SBS rubberized polymers and extra-strength interlocking fibers. Precisely blended into a smooth thixotropic material. A roofing mastic that contains a precise blend of asphalts, petroleum solvents, reinforcing fibers and additives that help with spreadability. Used for flashing construction and other detail roofing work, such as tie-offs or shingle securement. 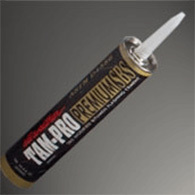 Provides waterproofing properties for temporary repairs or more permanent repairs when used with glass reinforcement. 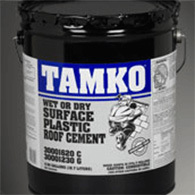 An all-weather roofing mastic containing special modifiers to help enhance bonding to damp surfaces. Used for flashing construction and other detail roofing work, such as tie-offs or shingle securement. 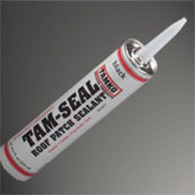 Provides waterproofing properties for temporary repairs, or more permanent repairs when used with glass reinforcement. A semi-mastic brushing-grade material consisting of pliable asphalt, quick-drying petroleum solvents and fibers (also known as blind-nailing or SIS cement). Serves as an adhesive between plies of 19" selvedge, smooth or mineral-surfaced roll roofing, and laps for cold-applied built-up. 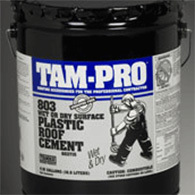 A proprietary formulation consisting of select roofer’s flux asphalt, prime quick-setting VOC-compliant petroleum solvents, minifibers and styrene-butadiene-styrene (SBS) rubberized polymers blended to a brush/squeegee-grade consistency. The substrate to receive the adhesive must be smooth. Irregularities may cause voids, thus inhibiting proper bonding. ASTM D 3019 requires minimum bond strength of 4.25 lb./in. after 24 hours. 37-GP-56M is the CGSB (Canadian General Standards Board) “Standard for: membrane, Modified, Bituminous, Prefabricated, and Reinforced for Roofing” that sets minimum Lap Joint Strength at 8.2 lb./in. A quick-drying low VOC, pure-asphalt-based material made with penetrating oils and fast-setting petroleum solvents. Suitable as a bonding agent between the surface and asphaltic cements and coatings used in roofing and waterproofing applications. A quick-drying low viscosity, pure-asphalt-based material made with penetrating oils and fast-setting petroleum solvents. Suitable as a bonding agent between the surface and asphaltic cements and coatings used in roofing and waterproofing applications. Materials consisting of high-quality asphalts, petroleum solvents and top-grade aluminum pigments. Suitable for covering prepared roofing, metal buildings, tanks, bins, grain elevators, exterior masonry and mobile home roofs. Coatings made with asphalts, petroleum solvents, fibers and aluminum pigments. Used for coating asphalt built-up roofing, modified bitumen membranes, flashings, other bitumen-based materials and metal surfaces. A semi-mastic material blended with asphalt, mineral stabilizers, petroleum solvents and fibers. For use on all types of low-sloped roof surfaces, with the exception of coal tar-based materials. 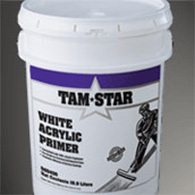 Also used on metal, concrete and masonry surfaces. A versatile coating consisting of a precise blend of clay, asphalt and water. 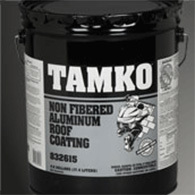 Provides an additional layer against weathering for asphalt roofing systems or properly prepared metal roofs. Also used as a surface preparation for the application of aluminum roof coating, as well as damp-proofing of concrete and masonry surfaces and ICF (insulated concrete forms). A coating consisting of a precise blend of clay, asphalt, sized fibers and water. Helps provide an additional weathering layer for asphalt roofing systems or metal roofs. Also used as a surface preparation for the application of aluminum roof coating, as well as damp-proofing of concrete and masonry surfaces and ICF (insulated concrete forms). CEMENTS AND COATINGS BEGIN TO AGE AS SOON AS THEY ARE EXPOSED TO NATURE. BUILDINGS EXPERIENCE AGING FACTORS DIFFERENTLY, SO IT IS DIFFICULT TO PREDICT HOW LONG CEMENTS AND COATINGS WILL LAST. THAT'S WHY TAMKO® PROVIDES A LIMITED WARRANTY, THAT INCLUDES A BINDING ARBITRATION CLAUSE AND OTHER TERMS AND CONDITIONS WHICH ARE INCORPORATED HEREIN BY REFERENCE. 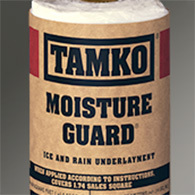 YOU MAY OBTAIN A COPY OF THE LIMITED WARRANTY AT TAMKO.COM OR BY CALLING 1-800-641-4691. 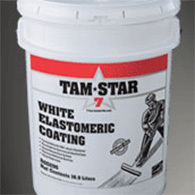 A white elastomeric coating suitable for coating over asphalt and metal roofing (including galvanized aged at least 6 months and prepainted metal roofing). Used for coating over asphalt rolled roofing and metal roofing (including galvanized aged at least 6 months and pre-painted metal) such as grain silos and ambient-temperature storage tanks. Can also be used over mobile homes, truck trailers and school bus tops. Highly reflective surface helps reduce surface temperatures to help lower cooling costs* and prolong the life of the roofing system. 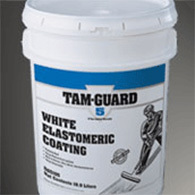 A white elastomeric cement suitable for sealing seams in metal roofs and repairing flashings and sealing around vent pipes and skylights prior to the application of reflective surface coatings. Used in conjunction with white resin-coated fiberglass reinforcing fabric. A translucent acrylic primer suitable for coating over APP and SBS-modified bitumen membranes and metal (including galvanized aged at least 6 months and painted metal). A resin-coated fiberglass mesh fabric used to help reinforce repairs to metal roofing seams and flashings. Also supports vent pipes and skylights. 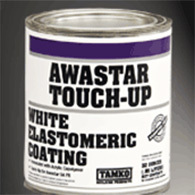 Used for AwaStar SA FR touch-ups. Made of a mixture of acrylic copolymers and reflective pigments that help reflect the sun’s heat. Offers a beautiful look and is 100% asbestos free. 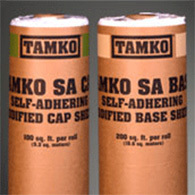 Cap: A lightweight, flexible, dual-coated, SBS-modified cap sheet constructed with a nonwoven polyester mat, self-adhering adhesive and a split removable release film on the adhesive side. It is surfaced with ceramic granules to help protect from ultraviolet degradation. Base: A flexible, fiberglass-reinforced, self-adhering rubberized asphalt sheet membrane with a polymer film on the surface and a removable treated split release film on the adhesive side. A choice for low-sloped residential roofs. 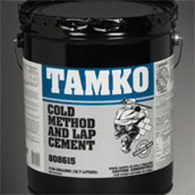 Applied using TAMKO® Cold-Method and Lap Cement or TAMKO Plastic Roof Cement. Available in a variety of colors to complement existing shingles and building materials. Used as the primary roof covering for low-slope residential applications with minimum slopes of 2" or 12". A choice for low-sloped residential roofs. 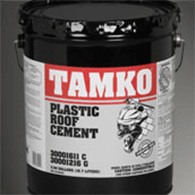 Applied using TAMKO® Cold-Method and Lap Cement or TAMKO Plastic Roof Cement. 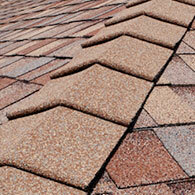 Available in a variety of colors to complement existing shingles and building materials. Used as the primary roof covering for low-sloped residential applications with minimum slopes of 2" on 12" or as flashing material.